Living in California and dealing with a drought for the last few years, we thought that after getting all this rain in the last couple weeks it was time for a nice rain song. Just because there has been well over 10 inches of rain fall in December, California needs to still keep hoping for rain through out the season. Enter “I Wish It Would Rain” by The Temptations. One of the music styles in the 1960’s that really made rock and roll what it is today was the Classic Motown sound. The artists that were signed to Motown at that time is a list of some of the greatest artists in the history of music. To name them all here would be to great of a task but you can go to the web site Classic Motown Artists to see all of them. Wish It Would Rain came out in 1968 and was produced by Norman Whitfield, Henry Cosby and the great Smokey Robinson. 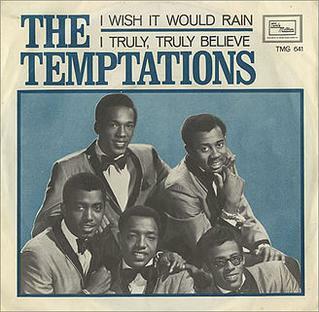 The single I Wish It Would Rain was written by Rodger Penzabene, Barrett Strong and Norman Whitfield. The songs story line is about a man hoping for some rain after his lady had left him. To explain the sound and how the song goes here in this post is not really necessary. All of us love and have heard the classic sound of Motown many times before. This entry was posted in Forgotten Rock Classics, Forgotten Songs, I Wish it Would Rain, Motown, Music, The Temptations and tagged Classic Rock, CS5711, Forgotten Rock Classics, Forgotten Songs, Music, Record, Rock Music, Song, Temptations. Bookmark the permalink. Jenny we hope that maybe this song can bring back some memories of other great Motown music. This song really doesn’t or did for that matter get the attention it deserves. Glad you enjoyed it. Claudia you will still be able to hear and read all these posts as we will continue to post weekly. We should have posted this song last week before the big storm Thursday but you are right it still is “The Perfect Song” for all the rain we are still getting here in California.